People smile in a number of ways and in a wide range of contexts, but according to a new study, all of them fall into one of three categories: reward, affiliation, and dominance. A smile is a strange thing. We do it by using our facial muscles, but more often than not, it’s more than just the mouth that smiles. A smile which doesn’t involve contracting the corners of the eyes, for instance, always looks a bit weird. It’s also not a completely involuntary reaction (like a grimace) — cross cultural studies have found significant differences in the way different cultures smile; obviously, we can also fake a smile. But no matter how people smile around the world, smiling is one of the most important social cues, and people have been doing it since forever. Actually, smiling predates the existence of modern people by quite a lot. Primatologist Signe Preuschoft traces the smile back over 30 million years of evolution to a “fear grin” stemming from monkeys and apes. Across history, smiling evolved differently in different species, and in humans, in different cultures. Also contrary to popular belief, smiling isn’t really a precursor for laughing — although we use it a lot when we’re amused. More than anything, smiling is used to convey social information. Sexual advertisement is one of its main functions. Every flirt starts with a smile, and smiling to someone is one of the simplest and more effective ways of telling someone you find them appealing. But a smile can do much more than that. It can show reinforcement, it can be used for manipulation, or even to mask confusion. Different people smile in a lot of different ways, but according to researchers from the University of Wisconsin-Madison, they all fall in one of three categories. “When distinguishing among smiles, both scientists and laypeople have tended to focus on true and false smiles,” said Paula Niedenthal, a psychology professor at the University of Wisconsin-Madison. The classical belief, she adds, is that a person smiles but isn’t happy, the smile isn’t sincere. But smiling is associated with so many emotional states, that belief is simply not true. In fact, it’s more than not true, it’s counterproductive. Believing that smiles are intrinsically linked to happiness skews our understanding of the process, and scientists want to change that idea. Reward smiles are displayed to reward the self or other people and to communicate positive experiences or intentions… the reward smile may have evolved from the play face of primates and canids. The second type is the affiliative smile, which above anything, communicates tolerance. It’s the “I don’t necessarily like you, but you’re OK” smile. It’s used to ease in social bonding. Affiliative smiles facilitate social bonding by communicating approachability, acknowledgment, and appeasement and thus may be functionally similar to the silent baredteeth display in chimpanzees that occurs during grooming, sexual solicitation, and submission. The third type has a darker side. The dominance smile is used to signify social status, but it also involves facial movement that is associated with joyfulness, which makes it a bit confusing. Dominance smiles serve to maintain and negotiate social or moral status and are associated with superiority or pride, defiance, derision, and contempt. 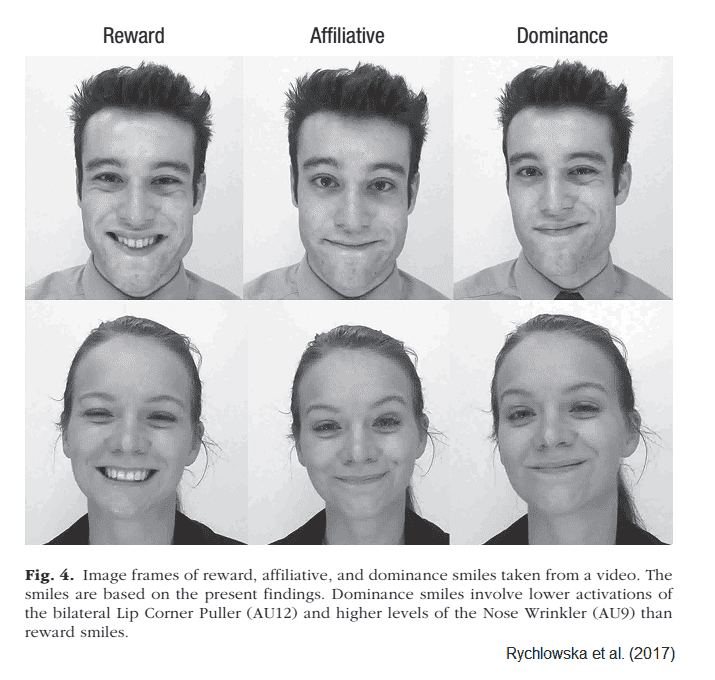 Unlike reward and affiliative smiles, dominance smiles are assumed to elicit negative feelings in observers. No homologous primate facial expression is known; however, some facial expressions displayed by high-status animal aggressors involve smile components. Rather ironically, in order to understand how humans smile, researchers analyzed thousands of computer-generated expressions, involving different (random) combinations of facial muscles. They asked volunteers to say whether each was a reward or affiliative or a dominance smile, or not a smile at all. After this, researchers looked at the algorithm that generated each smile and identified the ‘recipe’ for each type of smile. 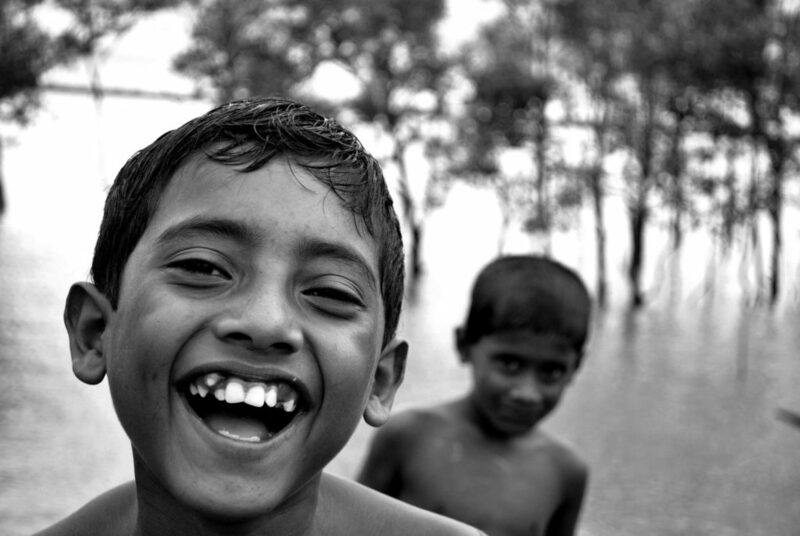 Two boys smiling in Bangladesh. Image credits: Sumon Mallick. Aside from better understanding our social cues, this study can also have a more pragmatic result: it can help plastic and reconstructive surgeons better repair and reconstruct people’s face bones and muscles, making them seem more realistic.